We were invited by friends to a special event at the American Restaurant in Crown Center, in Kansas City, Missouri. It is one of Kansas City’s finest restaurants. Alas, not expecting any need or desire for a camera, it didn’t occur to me to drag along my Nikon. And I could barely squeeze a lipstick and iPhone in my fancy (meaning tiny) evening bag. 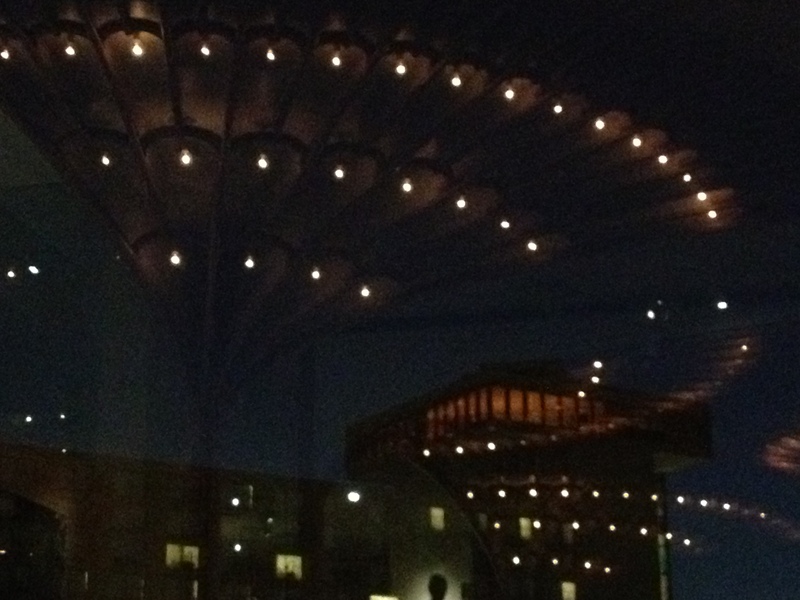 I was facing the center of the restaurant. Terry was beside me and had been talking with our host. He suddenly pulled out his iPhone and took a photograph of the western sky. If Terry noticed the view, I knew I needed to turn around to see what he discovered. The sun had just set and there was still some light in the sky. But the buildings were ablaze with color. I dug out my own iPhone and took a series of photographs. Here they are. This is the sky looking North West from Crown Center toward the Kauffman Performing Arts Center. Directly below us there was a nearly deserted street fair with a sky-walk that weaves through the center of the image. 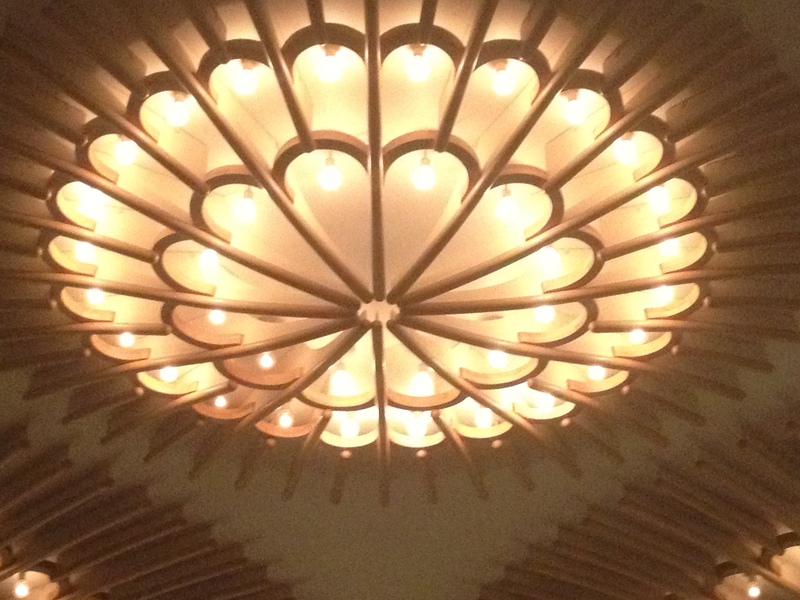 With my iPhone camera already at work, I turned back to the center of the restaurant and refocused my attention on the pattern of lights in the ceiling. Finally, I became that another window reflected the lights of the American Restaurant. When nearly all the residual light was gone, I took a final series of photographs. Funny that a lot of wonderful shots are just waiting to be noticed. 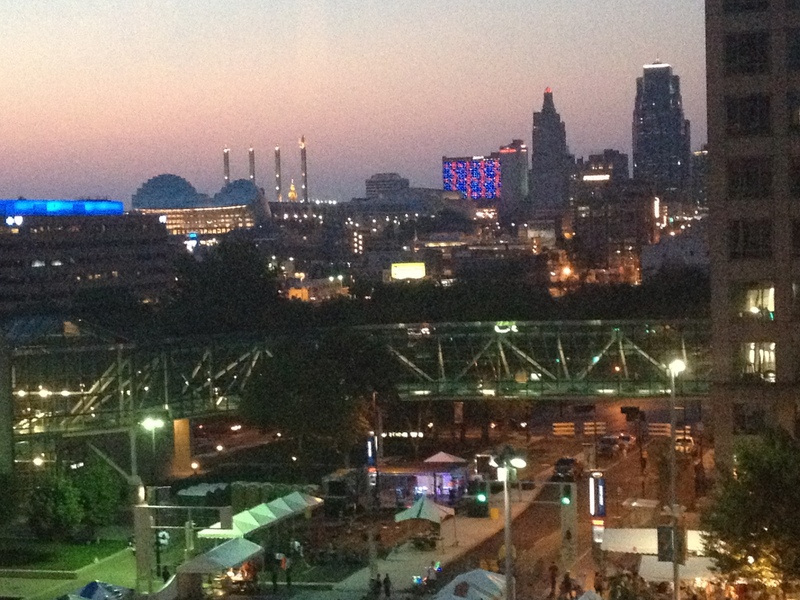 This entry was posted in Community and tagged American Restaurant, crown center, iPhone camera, kansas city, Kauffman Performing Arts Center, lights, reflections, sunset. Bookmark the permalink.